OnePlus is just two weeks away from the official launch of its latest flagship device, the OnePlus 6 in India. In addition to the regular device, the company will also unveil a special Avenger Infinity War edition of the OnePlus 6 on the launch date in India, 17 May. 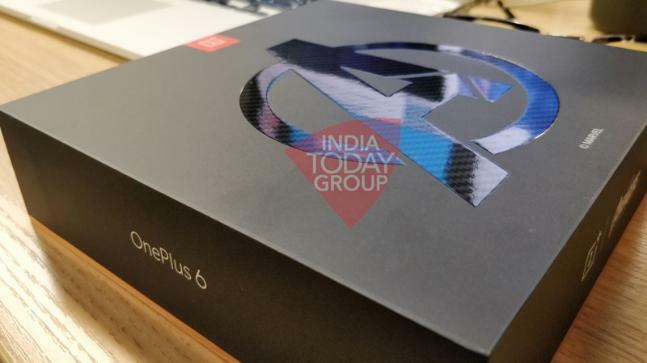 India Today has confirmed the OnePlus 6 special Marvel edition today in a picture of the retail box. The retail box of the special edition of the OnePlus 6 will be a lot different than the regular retail box and it will be a bit bigger too. The box also features a different type of finish which seems to be a kevlar finish on the box with a chequered pattern which is also the art of a promo video which OnePlus revealed a week ago about the Avenger Infinity War edition. It is also expected that the smartphone will come with some goodies in the box. The OnePlus 5T Star Wars Edition launched last year came with a special case and this time also we might get a special case with the Avengers edition. This new special case might get inspiration from the Marvel superheroes. Apart from the outer appearance, the smartphone will be featuring the same hardware and software as the regular variant of the OnePlus 6. The smartphone will be featuring a notch on the display with a glass back and some sort of water resistance. The smartphone will be powered by a Qualcomm Snapdragon 845 processor and up to 8GB of RAM. A 256GB internal storage variant has also teased by the company itself on the social media page.